A good heater can keep you from feeling the cold during the winter. Shopping online, on the other hand, can leave you feeling like you’re out in the cold. Manufacturers aren’t shy about inflating what their devices can do while leaving out the important details that would point to a potential flaw. We all know the pain of investing in a device that doesn’t live up to our hopes and expectations. However, we believe that consumers with the full facts can pick the model that’s right for them, and find one that will exceed their expectations. That’s why we’ve assembled these reviews of the best micathermic heaters of 2019. You can learn everything you need to know about each model or check out our buyer’s guide, which is designed to teach you everything you need to know about these products before you buy. The Bionaire Silent Micathermic BH39850-U is the best overall micathermic heater. It has multiple features that contribute to its great overall portability, including wheels, a carrying handle, and since it weighs about 12 pounds, it won’t be a burden to move around throughout the day. It has a thermostat with a range of settings. Depending on how big the space is and how well it is sealed against the elements, many people don’t end up using the hotter settings. It also comes with automatic tip-over shutoff, so you don’t have to worry about fires or other problems related to this model falling over. It’s also the quietest-running micathermic heater. If you didn’t know you turned it on, you might not realize it’s running, as it’s that quiet. That’s a relief compared to a lot of heaters, which work well, but can run noisily. The only issue with this model is that it has poor top-end heat. It doesn’t get as hot as some other models, so if you’re a cold-blooded person, you may find that this model doesn’t heat to your satisfaction. However, it will be more than enough for most people, especially if they’re heating smaller rooms. 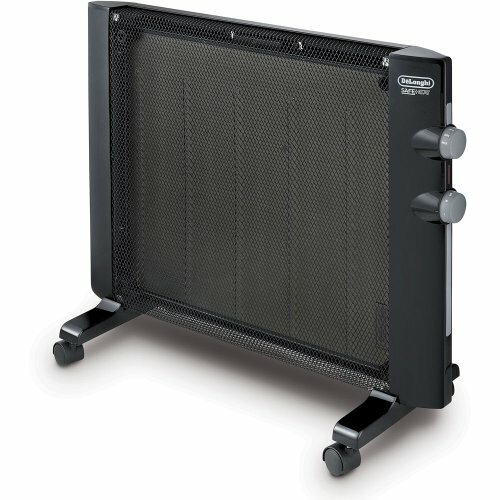 The DeLonghi HMP1500 Mica Panel Heater is another good choice for those looking for a micathermic heater. Unlike the previous model, it can be used as a floor unit, but can also be mounted to the wall, allowing it to become a more permanent fixture, and greatly reducing the risk of a tip-over. Like the previous model, it comes with a thermostat, though this model only comes with low or high settings, so you don’t have as good a temperature range as you would on the top model. It also comes with automatic tip-over shutoff, so if it does fall over, it will shut off before it causes a problem. Like the previous model, it will run quietly, though not forever. The primary problem that users have with this model is that after a few months or years of use, it will stop being quiet, and begin to hum or click. That’s a good sign that something has degraded on the inside, and that you should be more cautious when using it in the future. Overall, this is a decent model, but if it had better durability and longevity, it could take first place. As is, it falls to second. 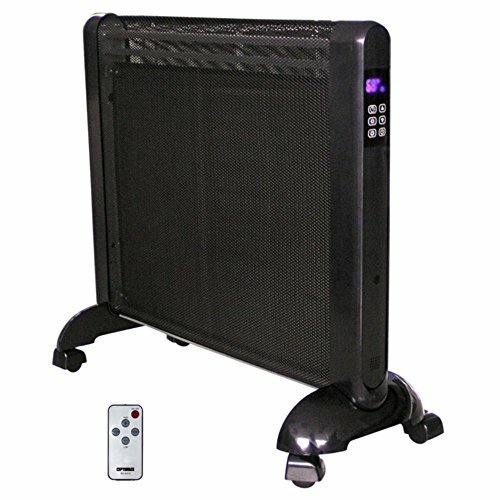 If you’re looking to get a good micathermic heater at a low price, then you should check out the TURBRO Arcade HR1015. This model works decently well, and since it’s 40 percent cheaper than the top model on our list, it earns the title of “best for the money.” It runs quietly and should do so for a very long time. It also gets to its maximum heat in about 30 seconds, so you won’t have to wait long before it starts heating the room. It’s very portable, as it comes with wheels, and weighs just over eight pounds. That means it’s easy to move around, and won’t be a strain on anyone’s back or hands. However, it only has average heating capability. In a small, well-sealed room, this heater will work wonders. In a large or poorly-sealed room, you probably won’t notice that this machine has been turned on. It is also a model that you shouldn’t expect to last forever. If you’re looking for excellent longevity, you’ll probably have to spend a bit more. But, if you’re going to be using your heater only occasionally, then you should get many years of good use out of it. The Optimus H-8412 Micathermic Flat-Panel at least tries to be a bit different from the competition, but it fails to deliver in those areas, making it a poor choice overall. The best thing it has going for it is that it is very inexpensive, though it leans more towards cheapness than good value. It does come with a remote, which is something that the other models lack. However, the remote doesn’t always work. Sometimes, that means not at all, though some users report that they can get a response when close to the unit, at which point it’s just as easy to use the controls on the heater. It also doesn’t run nearly as quietly as the other models on our list. Expect a variety of hums and clicks out of this model. You should also be aware that this model doesn’t have great longevity. Some users report that it lasted for less than two months before giving up the ghost. Overall, this model doesn’t provide a lot of value. While it’s cheap, you’re going to have to replace it sooner than later, which means you should probably spend more and get a model that will last far longer. Hopefully, you’re already getting a feel for these products after reading our reviews. If you’re looking to learn more about them, be sure to check out our buyer’s guide. This guide is filled with good general information about micathermic heaters so that you can understand what makes for a good model, and what makes for one you might want to skip. You can also get a feel for why we reviewed these products the way we did, and we’ve also included some tips that should help you get the best value for your money when you’re ready to buy. 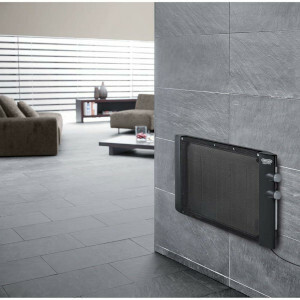 Micathermic heaters are the next big thing in heating technology. They work a bit differently from standard electric heaters, so if you want to get the best value for your money, you’ll want to understand how they work, first. Micathermic heaters take a standard electric heating element and coat it with a layer of mica. Mica is a name for a variety of minerals that have special properties. On heaters, the mica transforms the heat that is put out. Traditional electric heaters merely put out radiant heat. That makes them like sitting around a fire. The closer you are, the warmer you feel. Some ovens use convection technology, which circulates the air in order to achieve more even heating of the food inside. Micathermic heaters feature both radiant and convection heat producers inside of them. That means you’ll feel warmer the closer you sit to them, but they’ll also do a great job of heating the room as a whole. It also allows them to be smaller than standard heaters. The mica coating increases their efficiency, so you can get more heat output with smaller elements. And, having smaller heating elements means that they aren’t as power hungry. To recap, micathermic heaters heat rooms more effectively, are smaller, and use less power than traditional heaters, making them a fantastic addition to a cold home. 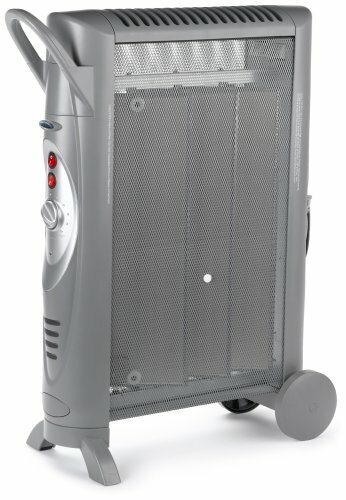 One feature that will greatly improve your experience with your new micathermic heater is how portable it is. Most micathermic heaters tend to be very small, which means you can usually move them around with little trouble. Of course, there are a few features you can find that go a long way towards making them far easier to move around. The most important of these are wheels. You can find micathermic heaters that you can roll around, saving you time and effort when it’s time to move them to a new place. Another feature that helps in this area is a handle. In fact, you can often find heaters that lack wheels but have a handle with which you can move them around. Finally, the lighter a model is, the easier it will be to move around. Micathermic heaters tend to weigh less than their standard counterparts, but that doesn’t mean that you can’t find extra-light micathermic models. Since all heaters come with some degree of risk, it’s important that you get a model that comes with adequate safety features. The good news is that micathermic heaters never use an open flame in order to heat up, so you don’t have to worry about sparks or direct flame contact causing a fire as you might with other kinds of heaters. Instead, like with standard electric heaters, your goal should be to make sure that hot elements don’t make contact with flammable materials in your home. A good way to do that is to keep it three feet or more away from furniture. Many models also come with automatic shut-off devices that turn the machine off if it tips over, which can prevent a lot of fires. These devices can also turn the machines off if it detects it is getting too hot, which can stop a fire before it starts. Different micathermic heaters have differing degrees of efficiency, which means they have different operating costs, and take different amounts of time to heat the room. The best models come with a range of temperatures at which they can operate. That means you can set them to the highest one to quickly heat the room, and lower it to run at a comfortable temperature after the room has been warmed. This is usually achieved by altering the amount of electricity that is flowing through the heating element. Less-expensive models tend to only have a “high” and “low” setting. On low, only one of two heating elements is on, and on high, but are turned on. That means that low is twice as efficient as high, though you may not be able to find a temperature that you like. If high is too warm, and low is too cold, you won’t be happy with your heater’s performance. Which micathermic heater is right for you? If you’re looking to get a great deal on a micathermic heater, it’s a good idea to look beyond the price. While that sounds counterintuitive, if you focus too much on paying as little as possible or on spending as much as possible to get the best features, you may find that you end up with bad value for your money. Instead, it’s a good idea to start with your needs. Figure out what size rooms you’ll need to heat, and how quickly you’ll need them heated, as well as how much temperature control you’re likely to need. Once you have that figured out, make a list of all micathermic heaters that fit those requirements. Then, choose the cheapest model. That model will have all of the features that you need to be satisfied, and since it comes at the lowest price, it will provide the best overall value for the money. The Bionaire Silent Micathermic BH39850-U is our favorite micathermic heater, as it comes with a thermostat, quiet running, and it is very lightweight and portable. 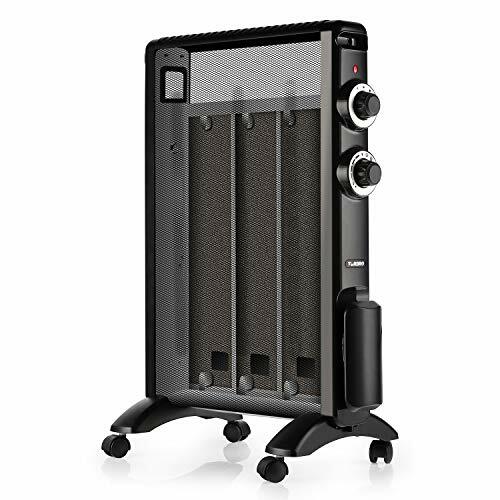 The DeLonghi HMP1500 Mica Panel Heater is an excellent overall heater, and has a thermostat, great safety features, and can be used as a floor or wall heater, though its poor longevity keeps it out of first place. The TURBRO Arcade HR1015 comes with quiet operation, fast heating, and is very portable. Since you can get it for a low price, it’s the beat for the money on our list. The Optimus H-8412 Micathermic Flat-Panel is inexpensive and comes with a remote, but it runs loudly and has poor durability, which means it drops to last place on our list. We hope that you’ve learned everything that you need to know about micathermic heaters. You should now be able to find the model that will keep you warm at a great price.